The Piggin’ range of figurines are all modelled by renowned artist David Corbridge. The Piggin’ range started “when David and his friend, had been discussing ideas for a new range of figurines.Recounting the sight of a pig called Tuesday contentedly sleeping with his head nestling comfortably in an old tractor tyre proved just the spark they were looking for and Piggin’ Tired became the very first Piggin’ collectible”. The first Piggin pigs appeared in 1993 and were produced by Collectible World Studios until 2006 when Xystos took over the range. 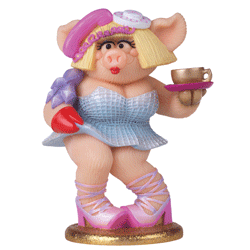 The Piggin’ Club started in 1994 and enabled members to receive club pieces, pins and news. It ran from 1994-2006 and was re-introduced again in 2007. Well over 300 have now been modelled. As well as the figures the company has produced a Piggin Waterglobe, mugs, fridge magnets, a money box, a range of Piggin teapots and even photo frames. The World Collectors Net is not affiliated with Xystos, or David Corbridge. These pages are intended to provide information to collectors of Piggin’.